Eyal Yanilov began practising Krav Maga at a very young age of 15 under the personal tutelage of the systems founder Imi Lichtenfeld. From such an early age he showed extraordinary talent as a student as well as an instructor, recruited by the grandmaster Imi to train high-level students and Krav Maga instructors Eyal eventually became Imi’s closest student and assistant. He is the only individual to personally receive the founders diploma of excellence and the then unprecedented rank of expert level 8 the highest rank in Krav Maga. Eventually, Eyal traveled abroad and began to teach the system in many countries around the world. 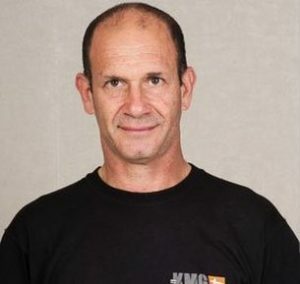 In the United States and Europe, Eyal taught Krav Maga to special military and law enforcement units, as well as to civilians. In order to manage the challenge of making Krav Maga truly international, Eyal founded the International Krav Maga Federation and served as its president, under the tutelage and with the support of Grandmaster Imi. In practice, Eyal has personally trained all of the world’s first-generation Krav Maga instructors. In addition to the many civilians training in Krav Maga centers, military and police special forces from around the world have adopted Krav Maga – as taught by Eyal and his team – as their preferred combat fighting system. Why Should you Train KMG/ Self Defence? Why should you train KMG / Self Defense? The truth is, a much better question would be – why should someone not make an effort to learn self-defense? No one even thinks about getting into deep water without knowing how to swim and if a thought like this comes to mind, that mind eventually will stay without a body, and the sea will remove the genes of that person from the gene pool. When we look at KMG(1) we know that it is not only about self-defense, so indeed there are additional benefits, factors and sectors such as “Fighting Tactics and Skills” and “3rd party and VIP protection”. A person should have a balance in life. Most people sit in front of their computer or handheld devices these days, and since we were not designed for this, we got so many health problems. Basically, we were born to move. KMG training is about movements and exercising the body, as well as exercising the mind. In every conflict there are mental elements. In addition, mental capabilities and resources are needed to deal with the stress that the event puts on you. Not all conflicts become physical, but still, making correct decisions in adverse condition is an important goal for any KMG trainee. Training techniques and tactics of KMG instill in you another dimension, courage. Confidence and knowledge on how to use techniques and tactics, together with the mental capabilities and physical resources that will enable you to solve conflicts of all kinds. With KMG training you will change your actions, habits, attention, awareness, body language and posture. Slowly your character will be strengthened. As your whole appearance will change, you no longer will look like an easy target, a victim. The result will be that aggressors will pick you less and less when they are searching for victims. If you were a person who used to attract predators, this will change over time. Doing physical activities that are relatively safe, holistic, demanding, and dynamic is great for your body and mind. Your fitness level will improve. Strength, flexibility, stamina, and endurance will improve. In KMG training you are exposed to a variety of drills and exercises, functional games and increasing demands that are suitable for your level. The result is a healthier body and mind. Improving your safety and security (stage 2) you get by training KMG. You also become able in protecting your loved ones, which is a good benefit. Having fun, helpful activities in a nice environment with people like yourself is a strong factor in belonging to a high-level community (stage 3). Reaching high levels and achieving a high grade is the next (4th) stage in the pyramid by Maslow. Would you like to assist people, help them improve themselves, teach them what you got and acquired, transfer to them your knowledge and powers that you got from your teachers? If yes, then becoming an instructor of KMG is something to think about. This is the highest stage in the pyramid, fulfillment, which also contributes to your personal growth, because giving is also receiving. So with all those benefits, is there any doubt? It is very clear why one should learn self-defense, and even better, not just self-defense but it should be KMG, and you should start now, not later. In the past years, people use to come up to me and say “Krav Maga saved my life”. This happened after they used techniques or tactics of KMG in reality when attacked. These days, much more often, people come up to me and say “KMG changed my life”. This is a higher complement and achievement. Keep on spreading the word. (1) As usual I write KMG also for Krav Maga, as these days there are so many who claim to teach Krav Maga but are fakes and were never certified or even had a month of real Krav Maga training. So I make this distinction. Would you buy a car without checking it, or a gun without trying it? Don’t start training Krav Maga without checking credentials and comparing it to the source. These days you have the tools of the Internet at your disposal, make the effort, it is about life and death, about saving and about changing your life.